A one day conference for school leaders, teachers, career practitioners and education support staff from Victorian mainstream and specialist secondary schools across the government, Catholic and independent sectors.The conference was designed to support school staff to use the Department’s new and updated resources that aim to provide tailored career education for students with a disability. 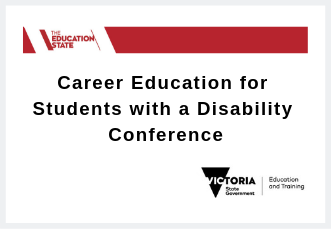 Participants heard from a wide range of speakers and participated in a variety of workshops that focused on delivering career education for students with a disability. Participants also received information about the new career education initiatives available from 2019.